Ride control systems on high-seed vessels are an important design features for improving passenger comfort and reducing motion sickness and dynamic structural loads. To investigate the performance of ride control systems a 2.5m catamaran model based on the 112m INCAT catamaran was tested with an active centre bow mounted T-Foil and two active stern mounted trim tabs. The model was set-up for towing tank tests in calm water to measure the motions response to ride control step inputs. Heave and pitch response were measured when the model was excited by deflections of the T-Foil and the stern tab separately. Appropriate combinations of the control surface deflections were then determined to produce pure heave and pure pitch response. This forms the basis for setting the gains of the ride control system to implement different control algorithms in terms of the heave and pitch motions in encountered waves. 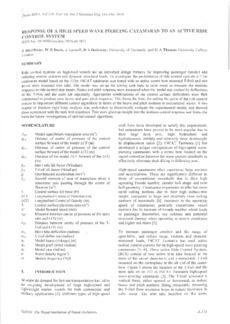 A two degree of freedom rigid body analysis was undertaken to theoretically evaluate the experimental results and showed close agreement with the tank test responses. This work gives an insight into the motions control response and forms the basis for future investigations of optimal control algorithms.